How to Weld: Tools, Equipment, Techniques, Gas Welding, Brazing, etc. Welding is a skill every do-it-yourself enthusiast needs in his arsenal. If you can't bond metal, you can't make repairs and you can't create; in short, you can't do much of anything except bolt premade parts together. How to Weld is both a perfect introduction for beginners and an excellent refresher for veterans. It's a work so comprehensive and so complete that most readers won't need any further instruction — just practice. In How to Weld, AWS-certified welding instructor Todd Bridigum thoroughly describes the tools and metals commonly used, proper welding techniques, and types of joints. All popular welding variants are covered, including gas, shielded metal arc welding (or stick), gas metal arc welding (or MIG), gas tungsten arc welding (or TIG), brazing, soldering, and even metal cutting. Each skill section concludes with a series of exercises, each illustrated with fully captioned sequential photography, to fully illustrate the techniques learned. 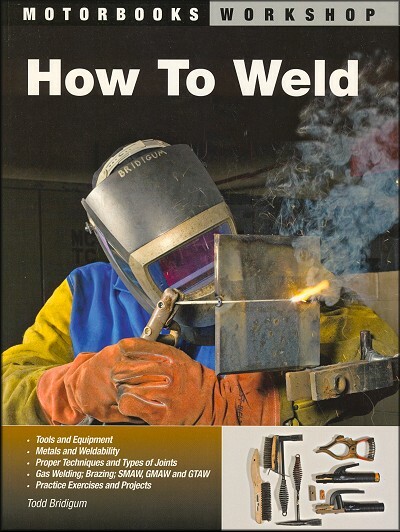 How to Weld is the only book about welding you'll ever need. Ask a question about How to Weld: Tools, Equipment, Techniques, Gas Welding, Brazing, SMAW, GMAW, GTAW.